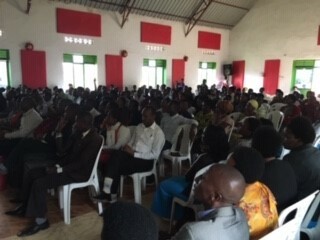 Greetings from the Hope Chapel and 7 Hills Rwanda campus. Shane Colwell and John Scudiere presiding. The Harvest Christian Church is one block away, this is where we teach during the week and today – Sunday – it is our home to worship. Here church services can go from 8 to 12 – no limiting sermons to less than a ½ hour here. The Services are an experience. 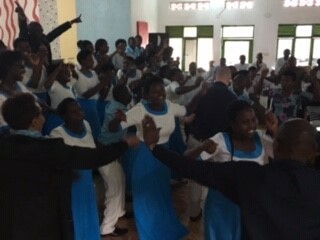 There are a half-dozen choirs, each in their turn sing and dance – as the volume increases so does the dancing for joy. The energy in the room is intoxicating. And yes, we do get pulled onto the floor when the choirs really get rocking. 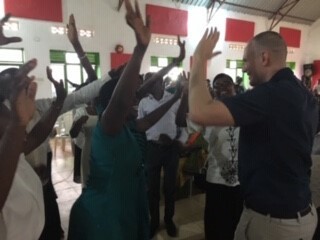 And yes, Theo was kind enough to take a movie of the muzungu share with Hope Chapel – in time for exhibition at the morning services – it is true, white men can’t dance, at least for the two of us. Shane came prepared to give a sermon on the Minor Prophet Book of Jonah (the one where Jonah gets swallowed by the fish, repents and gets spit out on the shore of Nineveh). 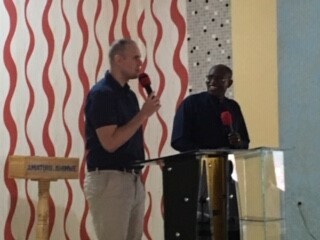 But as is usually the case in Rwanda, there are some surprises – Shane walks up to the podium, Theo (our host) says something to the crowd, he then translates for Shane – he told the congregation that Shane will now sing. Shane, being a good sport, thought for a second and then told about the origin of “It is well with my soul” and then proceeded to belt it out like only Shane can. Now Jonah is the Book Shane will teach on Tuesday – and I think he gave the full teaching to the entire church on Sunday. About six of the pastors we will be teaching for the next two weeks were at this service – I have already suggested to Shane that we should have the six of them give the teaching – Shane was that through in his delivery – they should be able to teach it. Both the song and message were received very well by all – great applause form a people that felt our love. Today was mostly a day of preparation. Shane and I, each have our assignments. In the morning we will greet our friends, get reacquainted, then Shane goes straight into a quick Old Testament history lesson: from the beginning, to the good/bad kings, who is militarily picking on Israel and Judah, who is taking them captive, when and where do they rebuild, who is wiped out of existence as a Nation – the usual. Could take a few hours. After a very filling lunch (for the pastors), when they are ready to slow down and nap (I hope not), I will teach the Book of Joel. I have assembled lots of tiny facts for the group to chew on – these pastors love the detail. So in the first half hour we will trip over the fact that scholars do not agree on when Joel was written (somewhere between 900 bc and 400 bc – it is either the first book of the minor prophets or one of the last – we will examine the evidence. Then onto locusts with lion’s teeth….